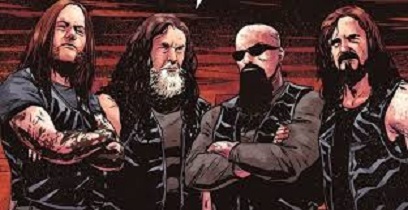 From writer Jon Schnepp comes Slayer Repentless #1, as the classic metal band is brought to life. This is worth checking out for the illustrations by Guiu Vilanova and covers by Glenn Fabry. The planet’s most badass metal band takes control of comics! The ultimate thrash juggernaut, Slayer has dominated stages and destroyed audiences for over thirty years, with their latest album, Repentless, showing no signs of slowing down or showing mercy. Based on the brutal Repentless videos, this expansion of the video story lines drives deep into the darkest heart of America, a raging road trip down a bloodstained highway, a tale of the doomed, the damned . . . and the repentless! Slayer Repentless #1 was published by Dark Horse on January 25, 2017.